Title it “Home”, and add a content to your page. Click on “Publish” button to save and publish your Homepage. Title it “Posts” or “Blog”… or whatever you want. Don’t type anything for the content of the page, it just needs a title. Click on “Publish” button to save and publish your page. 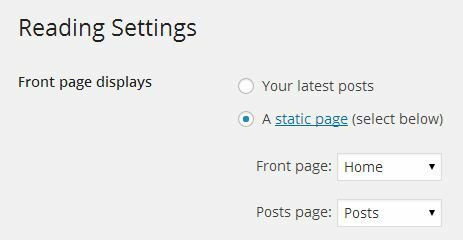 For “Posts Page“, choose the “Posts” or “Blog” page you created. Click on “Save Changes” button to save your settings. Open “General” tab and Scroll down to “Static Front Page “ tab menu and click on it. Click on the radio button next to ” A static page”. In “Front Page ” drop-down menu you can select any previously published pages, to display on your Homepage. …or you can create a new one by clicking on ” Add New Page ” link below “Front Page” drop-down menu. In “Post Page ” drop-down menu you can select any previously published pages, to display as your post page. …or you can create a new one by clicking on ” Add New Page ” link below “Post Page” drop-down menu. If you do not need a post page, leave the field blank. Click on “Publish” button to save your settings.